It’s amazing that we are marking the 110th anniversary of the birth of Paul Robeson (April 9, 1898 –Jan. 23, 1976). That’s because of his extraordinary life, his wealth of talents and abilities, his soaring intellect, but above all his magnificent heart, which beat for all the oppressed of the world! If this were the movies, it would’ve required a clap of thunder to mark this dramatic moment. As an artist, acting and singing on stages the world over, Robeson’s genius could hardly be denied. But, as ever, there was something greater than his immense talent. Again, I think it was his heart, from which poured a deep feeling of commitment to those who didn’t have his life options. It is especially meaningful when we consider that, when he spoke these words, he was surely among the wealthiest Black men in America – in 1941. What would a man such as this think of the bling-bling that has become the core of Black fashion? What would he think of such conspicuous consumption when so many are doing so poorly in this, the richest nation on earth? The Bay Area Paul Robeson Centennial Committee is to be commended for remembering this great Black world leader. How much such art as he produced is needed now! This column was written Feb. 28, 2008, for the 110th anniversary of Paul Robeson’s birth, on April 9, 1898. © Copyright 2008 Mumia Abu-Jamal. Read Mumia’s new book, “Jailhouse Lawyers: Prisoners Defending Prisoners v. the U.S.A.,” available from City Lights Publishing, www.citylights.com or (415) 362-8193. Keep updated at www.freemumia.com. For Mumia’s commentaries, visit www.prisonradio.org. For recent interviews with Mumia, visit www.blockreportradio.com. Encourage the media to publish and broadcast Mumia’s commentaries and interviews. Send our brotha some love and light at: Mumia Abu-Jamal, AM 8335, SCI-Greene, 175 Progress Dr., Waynesburg PA 15370. Paul Leroy Robeson was the U.S. working class’ greatest voice. One critic described his baritone as “the finest musical instrument wrought by Nature in our time.” His outspoken activism against racism and imperialism made him one of the most beloved heroes of the international working class. His support of socialism, close relations with the Communist Party, USA, and friendship with the Soviet Union also earned him the enmity of the U.S. ruling class. 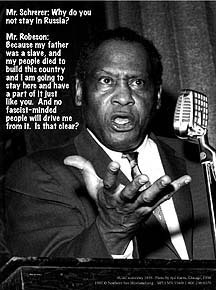 During the anti-Communist witch-hunts spearheaded by Sen. Joseph McCarthy, Paul Robeson became a target for repression. He went from being arguably the most famous person in the world to being erased from the history books. Now, after a six-year grassroots campaign, the United States Post Office is issuing a commemorative stamp in his honor. The stamp is the 27th to be issued in the Black Heritage series, which has also included Harriet Tubman, W.E.B. DuBois, Thurgood Marshall and Dr. Martin Luther King Jr. The stamp will be issued in 2004, in time for Black History Month. Robeson is perhaps the first U.S. communist to be so honored. 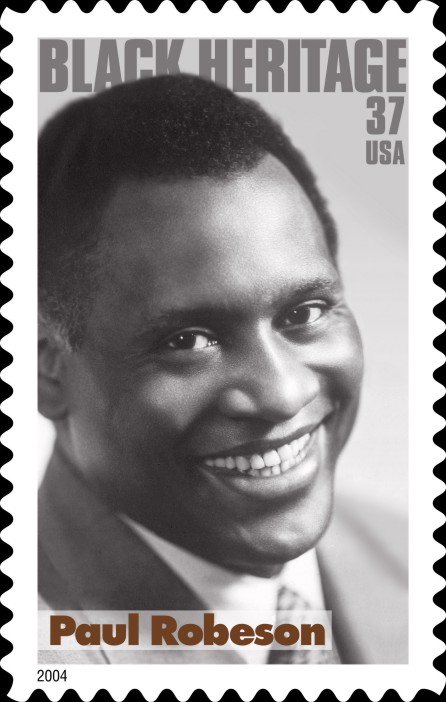 The campaign to have a Paul Robeson stamp issued began in 1997, one year before the centennial of his birth. The Chicago-based Paul Robeson 100th Birthday Committee started a petition, which they sent to the Citizens’ Stamp Advisory Committee. Unfortunately, despite the 90,000 signatures and massive public support, the committee rejected the stamp. By the time they agreed to issue the stamp, the Paul Robeson 100th Birthday Committee had collected nearly 250,000 signatures. However, the campaign’s success is not limited to the stamp’s approval. The work that went into the campaign also did much to educate the American people about Robeson’s life. 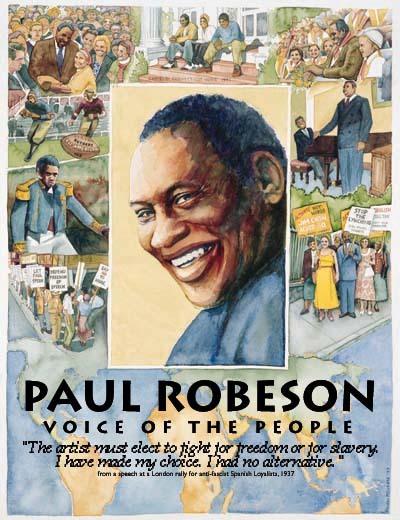 Mark Rogovin of the Paul Robeson 100th Birthday Committee stated, “We had this idea about pushing for the stamp and we obtained contacts from all over the United States in connection with the 100th birthday celebrations …. Many thousands or even tens of thousands of signatures were gathered at Chicago’s DuSable Museum of African American History. Every day, busloads of school children would visit the museum on field trips, learn about Robeson and sign the petition. The importance of spreading Paul Robeson’s story is evident to anyone who knows the story. Robeson was born in 1898 in Princeton, N.J. His father, a preacher, escaped slavery at the age of 15. His mother came from a family of Quakers who were involved in the movement to abolish slavery. A Renaissance man in every sense of the word, Paul Robeson excelled in each of the many fields in which he participated. He was only the third African-American to attend New Jersey’s Rutgers University, where he received a four-year academic scholarship. Despite the racism that he was forced to endure, including opponents refusing to take the field against a team that included an African-American, he excelled in both academics and athletics. He played baseball, football, basketball and track. He won 15 varsity letters and was named to the All-American football team twice. He was the valedictorian of his graduating class in 1919, member of both Phi Beta Kappa and the Cap and Skull Honor Society. The militant message Robeson brought to his art reflected his courage and his unwavering defiance in the face of oppression. He also proved his theatrical abilities in Shakespeare’s tragedy, “Othello,” when he became only the second Black actor to portray the character Othello on stage. Robeson also spoke and wrote in 20 different languages. His singing performances included not only spirituals and songs of the American working class, but also folk songs from different cultures around the world. Many people in the U.S were for the first time exposed to Chinese, Spanish and Russian folk songs through the booming voice of Paul Robeson. Even in his performances, Robeson always took a stand for justice. He refused to perform in segregated concert halls, and made a point of keeping admission affordable for working people. Paul Robeson is perhaps this country’s greatest example of the way in which artists have championed the cause of social justice. In a speech given in Spain where Robeson was a volunteer performer during the height of the Spanish Civil War, he asserted, “The artist must elect to fight for freedom or slavery. I have made my choice. I had no alternative.” Robeson did not just say the words; he lived them. Brandon Slattery is a working artist from Brooklyn, N.Y., and a member of the National Council of the Young Communist League (YCL). This story was first published at http://www.yclusa.org/article/view/1550/1/293. As too often happens with some of the better links to YouTube, the video above has been removed. Also, Paul Robeson's recordings are in the public domain. I hope young people will download this freely and learn to appreciate Robeson's magnificent talent which, like the very best of all music, can only spring from what we call "Soul Power".